A manure containing several ingredients acts in this wise: The effect of all of them in the soil accommodates itself to that one among them which, in comparison to the wants of the plant, is present in the smallest quantity. 'Laws of Minimum', in Natural Laws of Husbandry (1863), 215. Briefly, in the act of composition, as an instrument there intervenes and is most potent, fire, flaming, fervid, hot; but in the very substance of the compound there intervenes, as an ingredient, as it is commonly called, as a material principle and as a constituent of the whole compound the material and principle of fire, not fire itself. This I was the first to call phlogiston. Specimen Beccherianum (1703). Trans. J. R. Partington, A History of Chemistry (1961), Vol. 2, 668. Games are among the most interesting creations of the human mind, and the analysis of their structure is full of adventure and surprises. Unfortunately there is never a lack of mathematicians for the job of transforming delectable ingredients into a dish that tastes like a damp blanket. In J.R. Newman (ed. ), 'Commentary on Games and Puzzles', The World of Mathematics (1956), Vol. 4, 2414. I do not believe that science per se is an adequate source of happiness, nor do I think that my own scientific outlook has contributed very greatly to my own happiness, which I attribute to defecating twice a day with unfailing regularity. Science in itself appears to me neutral, that is to say, it increases men’s power whether for good or for evil. An appreciation of the ends of life is something which must be superadded to science if it is to bring happiness, but only the kind of society to which science is apt to give rise. I am afraid you may be disappointed that I am not more of an apostle of science, but as I grow older, and no doubt—as a result of the decay of my tissues, I begin to see the good life more and more as a matter of balance and to dread all over-emphasis upon anyone ingredient. Letter to W. W. Norton, Publisher (27 Jan 1931). In The Autobiography of Bertrand Russell, 1914-1944 (1968), Vol. 2, 200. In the case of chemical investigations known as decompositions or analyses, it is first important to determine exactly what ingredients you are dealing with, or chemically speaking, what substances are contained in a given mixture or composite. 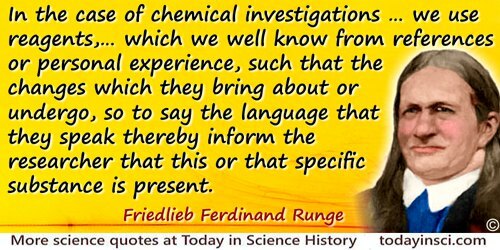 For this purpose we use reagents, i.e., substances that possess certain properties and characteristics, which we well know from references or personal experience, such that the changes which they bring about or undergo, so to say the language that they speak thereby inform the researcher that this or that specific substance is present in the mixture in question. The Unity of Science, trans. Max Black (1934), 22. Satire is a composition of salt and mercury; and it depends upon the different mixture and preparation of those ingredients, that it comes out a noble medicine, or a rank poison. In Tryon Edwards (ed. ), A Dictionary of Thoughts (1908), 502. 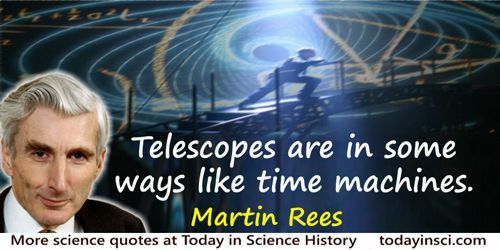 Telescopes are in some ways like time machines. They reveal galaxies so far away that their light has taken billions of years to reach us. We in astronomy have an advantage in studying the universe, in that we can actually see the past. We owe our existence to stars, because they make the atoms of which we are formed. So if you are romantic you can say we are literally starstuff. If you’re less romantic you can say we’re the nuclear waste from the fuel that makes stars shine. We’ve made so many advances in our understanding. A few centuries ago, the pioneer navigators learnt the size and shape of our Earth, and the layout of the continents. We are now just learning the dimensions and ingredients of our entire cosmos, and can at last make some sense of our cosmic habitat. The unavoidable conclusion is that the unprecedented meekness of the majority is responsible for the increase in violence. Social stability is the product of an equilibrium between a vigorous majority and violent minorities. Disorder does not come from an increased inner pressure or from the interaction of explosive ingredients. There is no reason to believe that the nature of the violent minorities is now greatly different from what it was in the past. What has changed is the will and ability of the majority to react. In 'Thoughts on the Present', First Things, Last Things (1971), 110.